First Row "raw" interlinear text from Paul Radin, Winnebago II, #6: 166-169. Second Row revised text from Paul Radin, Winnebago III, #6: 357.65-361.86. Third Row text in contemporary orthography. dedją́nadjedja tcira hąbĕra higikónąkcĕ giji. Teją́najeja čira hąbera higikónąkše, giži. *the MS has, "made so that no death could enter it." †the MS adds, "for me." *the initial /h/ has been dropped due to external sandhi. *the /-ži/ has been dropped probably in error. *the presumed  (based on the translation) is illegible. [there] he strengthened himself with his power, and in the water he dived. Farther down the page he writes, "Explain. This is utterly confused in my book." See notes 12-23, p. 342 in Paul Radin, The Road of Life and Death: A Ritual Drama of the American Indians. Bollingen Series V (Princeton: Princeton University Press, 1973 ). *a line leads from this word to the left top of the page where "in mouth" is written. *placed in brackets in the text, but with a check mark above it. There is a line with an arrow tip leading up to the top middle of the page where there appears to be a parenthetical questions mark, "(?)." This word, which means "lair" is here being used to refer to the seat. See below. †on the facing page, 166 v., Radin writes, "he used his seat as a dish i. e. as soon as he came out of the water, he used it began to eat. imprinted with light, and‡ four times he bit it, he lengthened the Light and Life. *on the facing page, 166 v., Radin writes, "rokisagedja haⁿbᴇriwagaxdjé[|] = he imprinted the daylight in the middle of his body, that is when he bit the fish the light would run into the gap made. ‡ Radin writes on the facing page within a semicircle, "halfway on body caused life to be imprinted." *the text adds, "Otter's wife." †Radin draws a line from the facing page (166 v.) to this area and remarks: "contained bones free of flesh (white)." *Radin's comment on the facing page (166 v.) probably applies to this passage: "That is the dish was marked with spots of food." *On the facing page, 166 v., Radin says, "As they went, & as much as the ocean was, like in a small vessel it was, so quiet was the sea." Two lines below, he adds, "like water in a little plate it was." With a line from the lower right of this facing page to this part of the text, Radin remarks, "As they walked the water of the ocean became as calm as if it were in a plate." rohíra, xóxe kįjiréže. Égi wa’ų́že. *for some unknown reason, /ī/ is written above the last letter. kinipgádją hóhŭŋgra sądjaŋxdjį́ją* rawagiγĕ́p k‘ínĭpcĕ. kinipgáją, hóhųgra sąjąxjį́žą rawagiǧép kínįpše. *on page 359 verso is a copy of page 355 ruled out with nine vertical lines. †gàdja has been lined out and replaced with gìji in keeping with the value of [τ]. *the /a/ in this word has "(?)" written above it. Wogų́zočira čáwararaìregi hoije jobóhą rúhaijegàją. the Creation Lodge that way they went step four he went. *an original "shell" was crossed out and "arrow" written above it, but that was later crossed out, and "shell" rewritten below both cross outs. The word literally means "arrow," but is here used to denote the shell that is shot during the Medicine Rite. †in the MS text, /c/ was inserted by a caret after the /t/, but in the recopied text, the /c/ was dropped, leaving just the /t/. The latter has been corrected. ‡the initial /y/ was corrected to /w/. The version beginning with /y/ is attested elsewhere, but the word may derive from wągé, "above." *the /é/ looks rather more like [ε´], in which case the word should end in -gádją. Xópini sąjąxjį́žą ejanąkíži, éja híguč rehíže. *translated as "stone," since stones collectively in the Medicine Rite are deemed to be the "Female Spirit." hijáhigàją, hokuruǧíčgàdją horuksúxjieja hahinąkše, giži. 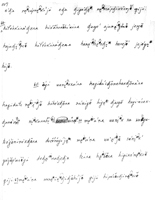 *the revised text has hok‘urusáxdji-èdja, which is unattested. The original MS reading seems to be correct: see horuksú(ra), "in the middle of a solid," attested four times. higádją horuksúxdji-édja hahinąkcĕ giji k‘araíp‘įje. higáją horuksúxjiéja hahinąkše, giži. Karaíp‘įže. the fourth time when he tried, he sent. The Creation Lodge. tci-ok‘ísak‘ honąjį́ṇa haŋkĕ́ įdjók‘ip‘ahip‘ìni djegi. He who Stands at the Center of the Lodge [not] unopposable he was. 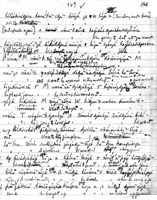 Jasper Blowsnake's Account of the Medicine Rite, in Paul Radin, Winnebago Notebooks (Philadelphia: American Philosophical Society, n.d.) Freeman #3876, Winnebago II, #6: 166-169 (the original handwritten interlinear text); Freeman #3886, Winnebago III, #6: 357.65-361.86. For a loose English translation, see Paul Radin, The Road of Life and Death: A Ritual Drama of the American Indians. Bollingen Series V (Princeton: Princeton University Press, 1973 ) 255-257.